Stop by for Fresh and local produce and goods! Hudsonville farmers are passionate about bringing the community together over farm fresh produce they have been growing for generations. 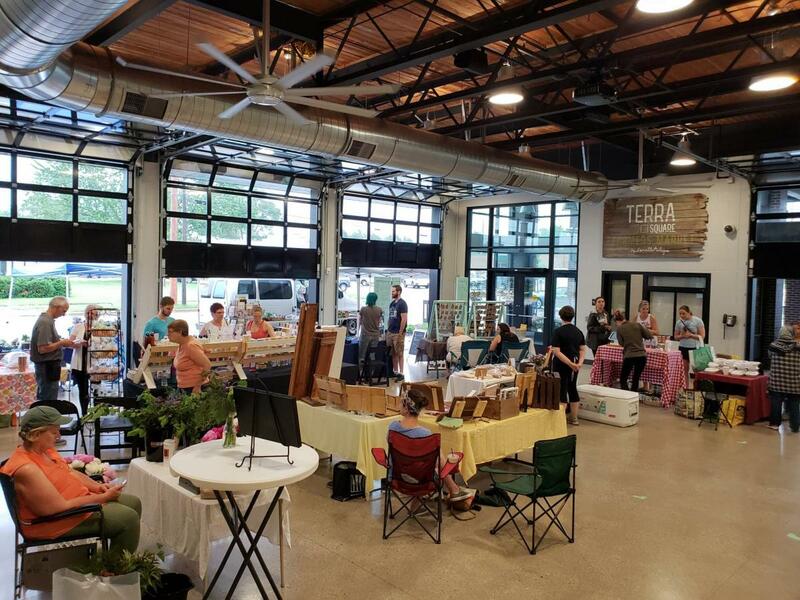 The Terra Square Farmer’s Market will be a place where we inspire healthy, full, and abundant living. Growing together, food and community. Our Farmers Market meets every Wednesday. Not only will this be a space to support and connect with local farmers and eat nourishing food, but also to spend time together with family and friends. The space will host kid’s activities, learning opportunities, and entertainment for all to enjoy. Terra Square offers you a space to connect. A space to be and celebrate with those you love. This is a space where the community can gather together around movie nights and yoga classes, but it is also a space where you can host your own special event, be it a graduation party, corporate event, or wedding. This is your space, use it to make memories! In the work space, there is a conference room that seats up to 16. It is equipped with technology to help your meeting run smoothly and offers you a creative space to grow your ideas! One of the goals of the project was to create a space that was for the Hudsonville community to use. In the rental rates, you’ll find this goal reflected, with discounts for City of Hudsonville residents. View the calendar to see if the space is available for your event! With that said, you do not have to rent the space to enjoy it! Come make memories at Terra Square at any one of our public events! Entrepeneurs and business leaders unite in Hudsonville’s only co-work space, where you can focus on your business, instead of your office. In the Terra Square Work Space, your membership gets you access to a space where you can be focused, creative, and inspired. A tenant within Terra Square, this restaurant is open seven days per week and offers locally sourced and handcrafted dishes.